THE PBA board has declined to renew the term of league commissioner Chito Narvasa for the next season, leaving the post vacant until a two-thirds vote is reached to appoint a new league chief. Seven governors convened in a special board meeting on Thursday morning and filed a resolution to “no longer support and endorse the renewal” of Narvasa. Incoming chairman Mon Fernandez of NLEX spoke on behalf of the board, refusing to label the controversial trade between Kia and San Miguel Beer as the final straw that triggered their decision. Although gaining the majority, the board still needs to get one more vote for a total of eight to start the process of appointing a new commissioner. After all, five representatives – three from the San Miguel Corp. group, and one each from Globalport and Kia, were no-shows in the board meeting. That's why Fernandez clarified they "are are not expelling commissioner Narvasa. We know that it takes two-thirds vote to expel him. We are just letting his term expire." TNT governor Pato Gregorio, Dickie Bachmann of Alaska, Mert Mondragon of Rain or Shine, Al Panlilio of Meralco, Blackwater’s Siliman Sy, Raymond Zorilla of Phoenix, and Fernandez attended the meeting and formed the majority. Fernandez has already informed Narvasa of the situation right after the meeting. “I have talked to him after our Board meeting informing him of the resolution. 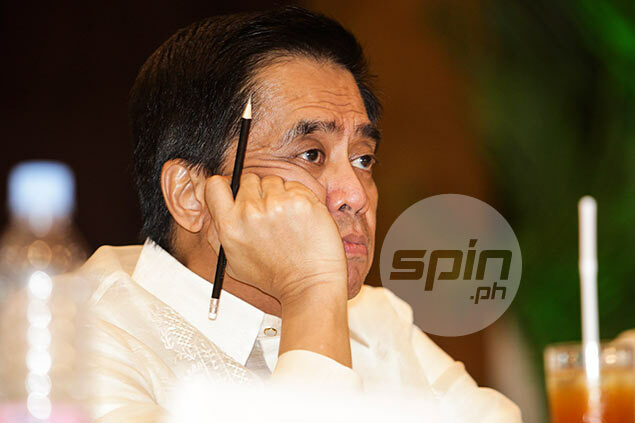 His only reply was he will explore his options,” Fernandez said, although adding it’s best for Narvasa “already to recluse himself from the planning” session on November 14. Fernandez declined to rattle off the names of possible candidates for replacement.